This section provides a tutorial example on validating and inspecting a WSDL 1.1 document using SoapUI. One important function of SoapUI is to validate and inspect WSDL documents. Here is what I did to validate and inspect my first WSDL document, Hello_WSDL_11_SOAP.wsdl. 1. Run SoapUI and click "File" > "New SoapUI Project"
Create Requests:  [x] Create sample requests for all operations? 3. Click OK. SoapUI will validate and import the specified WSDL document. 4. When importing is done, "helloProject" is created and displayed on the left of the windows. There should be no importing error, because Hello_WSDL_11_SOAP.wsdl is valid WSDL document. Very nice. My Hello_WSDL_11_SOAP.wdsl has been validated and imported correctly. 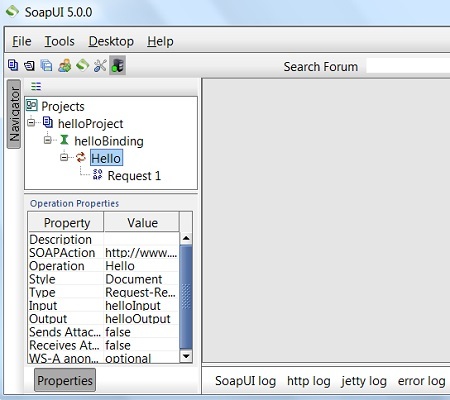 SoapUI allows you to inspect interface properties and operation properties.